Cosmonaut Alexander Serebrov seen during the Soyuz TM-17 mission on one of his ten Guinness World Record spacewalks. Serebrov died at age 69 on Nov. 12, 2013. Alexander Serebrov, a Soviet-era cosmonaut who once held the Guinness World Record for the most spacewalks and who was the first to test drive a "space motorcycle," has died at 69, according to Russia's federal space agency. Serebrov's death at his Moscow apartment Tuesday (Nov. 12) was described as "sudden" by Roscosmos officials as part of a statement posted on the agency's website. "The leadership and staff of the cosmonaut training center are sorry about the loss and express their condolences to the families and friends of A.A. Serebrov. The memory of [Serebrov] is forever in our hearts," the officials wrote. A veteran of four spaceflights, Serebrov was selected as a cosmonaut in 1978 with the fourth group of engineering candidates. Between 1982 and 1994, he flew to two space stations — twice to Salyut 7 and twice to Mir — logging a career total of 373 days in orbit. Serebrov came close to returning on board Salyut 7 during his second trip to space. Instead, he and his crewmates, Vladimir Titov and Gennady Strekalov, needed to make a quick turnaround for Earth. Launched in April 1983, the Soyuz T-8 mission was bound for the Soviet orbiting outpost when the shroud protecting the Soyuz spacecraft separated as planned but tore with it a critical radar antenna boom needed for an autonomous docking with the space station. The crew attempted to fly a manual approach to Salyut 7, but aborted the attempt to avoid a crash. With their rendezvous canceled, the three cosmonauts returned to Earth two days after launching. Serebrov had better luck on his flights to Mir. Serving as a flight engineer on the fifth and 14th crewed expeditions to the last of the Russian orbital complexes, Serebrov's first trip to Mir lasted 166 days from September 1989 to February 1990. Together with mission commander Alexander Viktorenko, Serebrov operated experiments and embarked on five spacewalks, the latter outfitting Mir with new sensors and equipment racks. It was on his fifth spacewalk of the mission that Serebrov first demonstrated the Ikar ("Ikarus"), the so-called "space motorcycle" that allowed the cosmonaut to fly around the station, similar to the NASA manned maneuvering unit, or MMU. Despite its motorbike moniker, the SPK (as it was formally referred) resembled more a floating armchair than its two-wheeled nickname. Serebrov's final mission to space, Soyuz TM-17, also had him perform five spacewalks, earning him a place in the Guinness Book of World Records for the most outer space outings made by any cosmonaut or astronaut, a record he held for four years. Serebrov's 196-day stay on orbit almost ended in tragedy when he and his commander, Vasili Tsibliyev, lost control of the Soyuz TM-17 spacecraft after undocking, colliding with Mir twice. Fortunately, the Soyuz and space station escaped serious damage — the Mir crew did not even feel the impact — and Serebrov and Tsibiyev returned to Earth the same day on Jan. 14, 1994. Serebrov retired from the Russian space program in May 1995 to work as an advisor to then President Boris Yeltsin on issues relating to spaceflight. Alexander Aleksandrovich Serebrov, born Feb. 15, 1944, attended the Moscow Physics Technological Institute. He earned his post-graduate technical sciences degree from the same school in 1970. In 1976, Serebrov joined the design bureau NPO Energia (today, the S.P. Korolev Rocket and Space Corporation, or RSC, Energia), where he was when he was recruited for the cosmonaut corps. Serebrov was awarded the title "Hero of the Soviet Union" for his contributions to the nation's space program, as well as the Order of Friendship and twice Orders of Lenin. Serebrov served as president of the the All-Russian Youth Aerospace Society (VAKO) "Soyuz," the first scientific-educational youth society in Russia, and led the Young Cosmonauts educational organization. 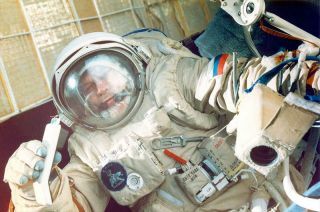 During his first stay on Mir, Serebrov became the first space traveler to deliver educational lessons from space, dedicating the last of his sessions to the memory of teacher Christa McAuliffe and the fallen STS-51L Challenger crew. Follow collectSPACE.com on Facebook and on Twitter at @collectSPACE. Copyright 2013 collectSPACE.com. All rights reserved. Follow us @Spacedotcom, Facebook and Google+.